All Prickly and Leave Me Alone — Ginger writes. My kids think I’m a real writer because TJ took a series of devotions I worked on over the summer and had them printed in a book format. I am a real writer but that’s not the reason. The reason is because I write. That’s all it takes. You show up to write day after day, and you can call yourself a writer. The line above is from one of the essays I wrote for the book, and the phrase “a cactus mom, all prickly and leave me alone” is one of the lines of which I’m most proud. I am not proud that I’ve been a cactus mom, but I love the image that came into my mind to describe a part of me that I am working to change. After I finished my summer writing project, I knew I wanted to keep writing. I decided for the month of October to spend a set amount of time each weekday writing in a journal on the themes of motherhood and attachment. Natalie Goldberg says in Writing Down the Bones that “Writing is the act of burning through the fog in your mind.” I wanted to burn through the fog on why I have found it difficult to be responsive and nurturing toward my children, and I wanted to explore how my own upbringing might have affected how I view motherhood. Goldberg also says in her book that “Writing gives you a great opportunity to swim through to freedom.” I am amazed how acknowledging my deep feelings and long-held beliefs on paper, without judgment, has slowly helped me to untangle some of the emotional knots that have bound me as a parent. Taking the time to write regularly on these ideas has increased the desire I have to connect with my children, to know them as people, and to value them for being rather than doing. All month, I have been using a verse from the Bible as an anchor for my reflections. I am thankful to have God as a model parent, but also to have friends in my life who model to me what delighting in one’s children can look like. 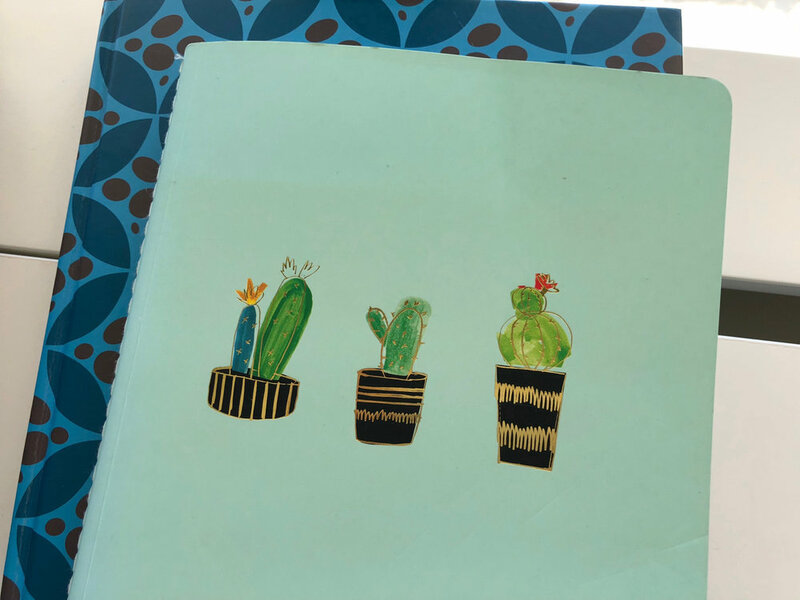 It was only today, as I prepared to write this blog post, that I realized the journal I had chosen for this month of writing on motherhood has cacti on the front. How funny! I would like to share one of the journal entries from earlier this month, as a way to show the sort of thing that can happen when you spend just a few minutes a day “burning through the fog in your mind” and “swimming through to freedom.” The Holy Spirit is a gentle guide and it was Mr. Rogers who said that Anything mentionable is manageable. I won’t always be a cactus mom because I’ve admitted to being one. I will begin again with this guiding verse, “The Lord is compassionate and gracious, slow to anger, abounding in love.” I think I know what kills my compassion and graciousness - my desire and constant striving for efficiency in all areas, in all ways. I think I have made efficiency and productivity my gods. How much can I accomplish and how efficiently (meaning no wasted time or false starts or things running off course or schedule)? Does this feed a hole, a gap in me? Is this a lie I’ve been living? “Because I produce, therefore I am.” Or “Because I get stuff done, therefore I am.” What if I’m succeeding at the wrong thing? I wonder how I missed learning the importance of relationships. I became a “do-er” at an early age, I think. There was no place for “be-ers” - maybe I thought this in my family, so I became one who does. This gave me a sense of self-worth, to achieve and to be the best. I was a driven child, adolescent, college student. Much of the “relating to people” I did was out of a sense of obligation, but somehow I think parts of my personhood got lost. I forgot what it was to be human, to be valued for my person-ness instead of for my productivity - and that, over the years, led me to forgetting to value the personhood of others. I have felt more like a machine than a real, live person for about as long as I can remember. But I was a little baby once and my parents named me Ginger. I was the first grandchild on both sides and I know for sure that I made MaryMa the happiest grandmother in the world. I became a toddler, then a preschooler, and spent those years going to daycare. Was I a happy little person there? Were my caregivers happy to have me around? I wish I remembered more about those years when I assume I was more of a human being just being. I remember the rolling food cart in the hallway of Jerry-Ann (the daycare) and being served peas for lunch on those light green hard plastic lunch plates divided into sections. I remember some friends from daycare: Melanie, Brandy, and Amy. I remember Amy’s mom worked at Belk and we would see her there when my mom took us shopping there. I remember the big classroom at Jerry-Ann where the TV was mounted high on the wall. I remember, as an older child, probably some summer of elementary school, playing Canasta in that same large classroom with the lights off because the TV was on. I remember being so afraid to ride the bus when I was in first or second grade. I would go stand by Mr. Bass (the sixth grade teacher’s) door and wait for him because he drove the bus and I knew if I was with him, the bus wouldn’t leave me after school. I assume my mom set up that arrangement so I wouldn’t be afraid. How long did I go stand by his door and wait for him? A few weeks? A few months? And just like that, the timer on my watch went off and I ended that day’s journaling. I didn’t solve anything, but I took time to go back and look for clues. I took time to think fondly of MaryMa and to be grateful to my mom for figuring out a plan that would help me fear the bus less. I took time to face my past, which is helping me face my present. Because Anne Lamott always has something to say, this post wouldn't feel complete without some of her wisdom.